Just launched: for the luxury spa and high-end mobile technician. Includes 500ml of our very best tanning solution. Treat your discerning clients to the ultimate in tanning perfection with the new Aura Allure, developed by HVLP manufacturing perfectionists, Wagner. 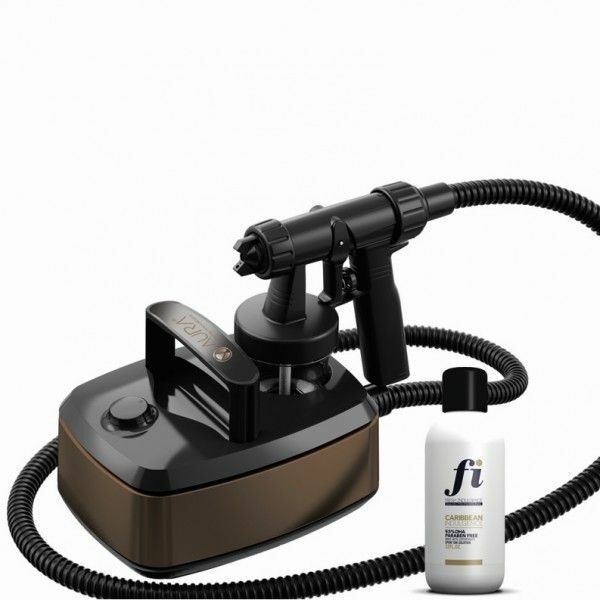 The smoothest, most even tan possible thanks to its patented satin spray nozzle technology. This Swiss-designed gun is the result of extensive testing, and delivers the finest atomisation possible with exceptionally low overspray. Fresh Indulgence tanning solutions also offer perfect atomisation and spraying efficiency, making the new Allure a marriage made in heaven for your business. Some poorly formulated tanning solutions can apply very much like water and fail to form a fine mist, resulting in a patchy tan and a lot of wasted product. Maximised profits due to greatly reduced overspray, energy efficiency and unrivalled technical reliability (no down time and damage to your reputation). The Allure comes with a two-year warranty, backed not only by Wagner itself, but also by us at Fresh Indulgence. Introduce this new system to your busy schedule with total peace of mind - you're covered. Complete portability as a result of an ingenious retractable carrying handle, cable storage and unique gun holder. The gun will also stand independently away from the machine itself, should you choose to take advantage of the extra-long 3.5m hose that the Allure is equipped with as standard. With its extremely quiet 76dB turbine, however - 14dB quieter than any other HVLP on the market - you may not have any reason to. Extra capacity 200ml translucent cup. 'Twist and lock' hose feature ensures your spray tan hose is completely secure and will not come loose during tanning. Fine tuning flow control dial. We are combining this beautiful system with 500ml of our most luxurious tanning solution. Choose from our award-winning Original Fresh Indulgence blend, available in light, medium or dark DHA levels, or our cutting-edge Electric Tan rapid tanning solution. The original Fresh Indulgence range offers the smoothest, most natural-looking tan possible. Specially formulated for those with the most sensitive of skins, this tan also contains skin-conditioning ingredients and natural extracts to leave the skin feeling smooth and hydrated. Electric Tan is a rapid tanning formula, which can be washed off in half the time of a normal tanning solution. This makes it perfect for clients 'on the go' or getting ready for a party. Applies warmer to the skin than a traditional tan. 230V, energy-efficient 280W turbine with no sacrifice on propulsion.